A year ago today I made the first commit to the Git repository of Simple Go. Coincidentally, I finished the new release I’ve been working on almost exactly one year after the first commit. The major new features in the latest version are a simplified status bar, a settings dialog window, and the use of a configuration file to store settings. Additionally, with the new settings dialog comes the ability to control more settings, including the player names (to be stored in SGF files), setting GNU Go to control either Black or White (or both), controlling the number of seconds GNU Go can use to make a move or score the game, and specifying the komi value. 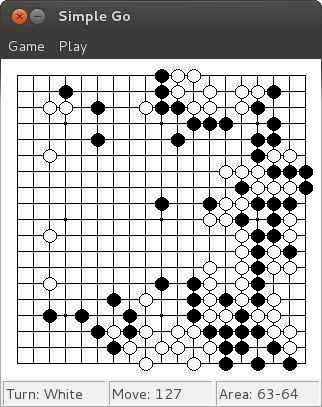 At this point, Simple Go does more or less everything I’d envisioned when I first started the project. Of course, I will continue to fix bugs and add new features when inspiration strikes, but at this point I’m happy with how Simple Go turned out, and will use it to record my games. So there you have it — from idea to realization in one year!